It’s not an easy task to make biopics in India, you have to make a lot of compromises to make sure that nobody gets offended with your film and glorify the protagonist with all necessary positive aspects. 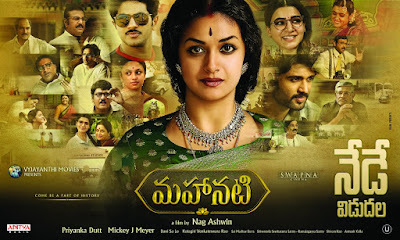 Nag Ashwin’s Nadigaiyar Thilagam also have these shortcomings but the film stands tall with the collective team effort and the towering performance of Keerthy Suresh. 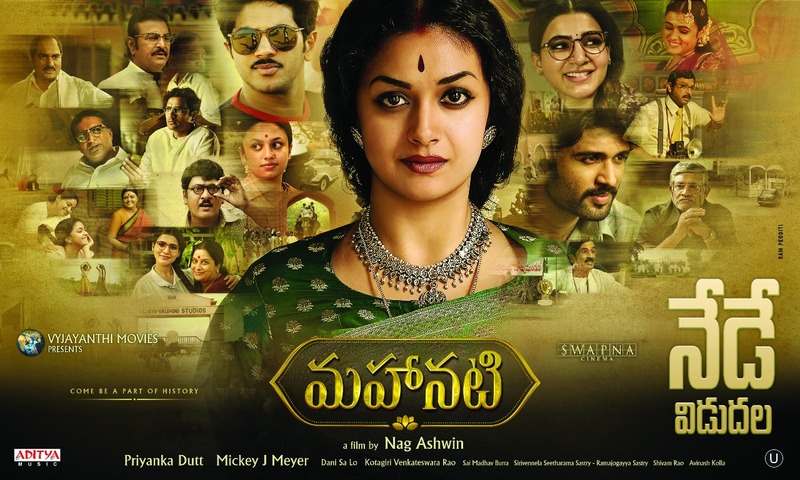 Nadigaiyar Thilagam basically deals with the rise and fall of veteran actress Savitri (Keerthy Suresh) who hails from a small village Chirravuru and becomes famous in her place for her acting stint in local drama troupe. Driven by her passion for acting, Savitri comes to Madras with her uncle K.V. Chowdary (Rajendra Prasad) to become a film actress but the unfamiliar language, camera and lights mount more pressure on the actress that she fails in her first attempt. If someone criticizes Savitri, she has the habit of bouncing back like a lioness. During her brief stay in Madras, photographer Ramasamy Ganesan (Gemini Ganesan played by Dulquer ) clicks a pic of Savitri which eventually gets her the first film offer and from there, there is no looking back. Ramasamy Ganesan also becomes a famous actor and despite being married, he falls in love with Savitri. Slowly, Savitri too gets smitten by the candid speech and the pampering of Ganesan and agrees to marry him. Everything goes well until Savitri becomes a superstar in South Cinema and Ganesan couldn’t match up with her stardom so there comes the ego battle. Savitri holds on to the relationship until she gets to know the darker side of Ganesan and from that point, her life turns upside down. Nadigaiyar Thilagam basically starts from the fall of Savitri, she goes to coma and we get to know about her legendary status, personal and professional losses, philanthropic nature, alcohol addiction, and recovery only through the journalist Madhuravani (Samantha). Keerthy Suresh has delivered her career-best performance in Nadigaiyar Thilagam, she emotes various expressions with a great ease in the film. As a young girl, Keerthy attracts with her unparalleled energy level, innocence, egoistic nature, and naughtiness. Slowly the naughtiness fades away, Keerthy transforms into a majestic heroine but still, there is innocence. Post-wedding, we get to see her patience. There is a dialogue in the film once she signs Mayabazar saying ‘The story only begins now’ and from there on, Keerthy transforms into a queen, she no longer cracks jokes and there is no hyperactiveness in her body language, we only see the elegance and her big heart to help everyone around her. The scene where she gets to know the darker side of Dulquer and breaks out in frustration is easily the best part of her performance in the film. The post break-up mental trauma and alcohol addiction have been portrayed beautifully by Keerthy, she actually becomes a demon and only after falling ill, she comes out of her weakness for her children. It’s not easy for a 25-year-old actress to portray thirty years life of a legendary actress but Keerthy has pulled it off in style and this film certainly has broken all the doubts about her acting talent, meme creators can rest in peace for some time. After Keerthy, it’s Dulquer who deserves a special mention. Only because of Dulquer’s character, Keerthy earns sympathy, a hero should be bold enough to play a grey-shaded character and Dulquer needs to be appreciated for his gutsy move. The irony is that despite knowing his darker side, we fall for him just like how Keerthy does in the film. Samantha has also excelled as the timid stammering journalist Madhuravani, especially in the climax scene. There is absolutely no compromise from the technical team of Nadigaiyar Thilagam, the film’s cinematographer Dani Sanchez-Lopez used various color tones and angles to convey the emotions. There is a particular scene where Keerthy holds the liquor bottle in her hand for the first time and the frame slowly turns upside down, her life also turns upside down from that scene. In another scene, she breaks the mirror and we get see Keerthy’s face in the broken pieces, such subtle narrative adds more classiness to the film. The editing pattern was also brilliant, they only send us out of the theater with a recap of the majestic life of Savitri and not her downfall, which is indeed a clever move. The art department has also done an amazing job in recreating the iconic studios, trams and the 19th century Chennai (Madras). On the downside, though Samantha-Vijay Devarakonda’s romantic portions have been placed for lighter side in this emotional drama, sometimes it distracts us from the core plot. Director Nag Ashwin must be appreciated for his immense research, he also extracted the best performance from his actors, technicians and the entire team. We understand that a few things can’t be portrayed in Indian cinema as there is no enough freedom here but still what he has done is really commendable, he didn’t point anyone and not portrayed them as dark in Nadigaiyar Thilagam, he has only showcased their different shades. For example, we were shown both the good and bad in KV Chowdary, he could be portrayed as a selfish maternal uncle too but Nag Ashwin hasn’t done it and the same applies to Dulquer and Keerthy ’s characters as well, such calculative move requires a great maturity. Overall, Nadigaiyar Thilagam is a must watch because we know that Savitri was a superstar but to understand what it costs her to be the legendary actress, you have to watch the film!